A 120lb Minnesota woman put everyone's carnivorous capabilities to shame last Friday, when she scarfed down a whole 72oz steak in less than three minutes... WITH HER BARE HANDS. 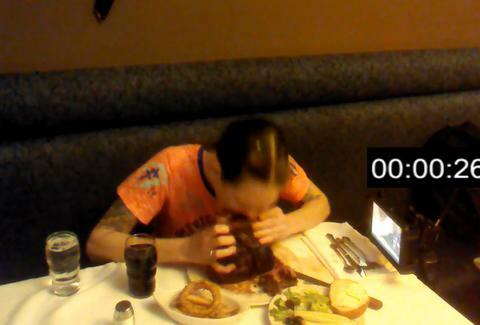 Top-ranked competitive eater Molly Schuyler took on Sayler's Old Country Kitchen's challenge, a feat that involves eating about half a cow and an assortment of sides within an hour. Schulyer managed the feat in less than three minutes -- beating the previous record of 6mins, 48 secs and adding the ungodly feat to a list of accomplishments that also includes eating 9lbs of cottage cheese in 2mins and a 9lb burrito in less than 5mins. One of eight women to have successfully beat the beef, watching her ravage the meat like Paula Deen on a stick of butter is truly a sight to behold. It's a little gross, very frightening, but mostly downright impressive. This is history unfolding before your very eyes. Rachel Freeman is a food/drink editorial assistant at Thrillist. She believes cheese is a basic human right, and one best pursued while alone in bed with Netflix. Follow her into the abyss at @rachelifreeman.